Oxbridge club Slovenia is organising a a series of wine tastings for our members. Wine tastings will take us across the wine regions of Slovenia from Jeruzalem to Goriška Brda, featuring key producers and grape varieties. We are proud of our member Domen, an expert blind taster who was featured in the 1843 magazine article on Oxbridge blind tasting. Wine tasting series is starting in November 2018. For more information and to book a place, get in touch via Contact page. 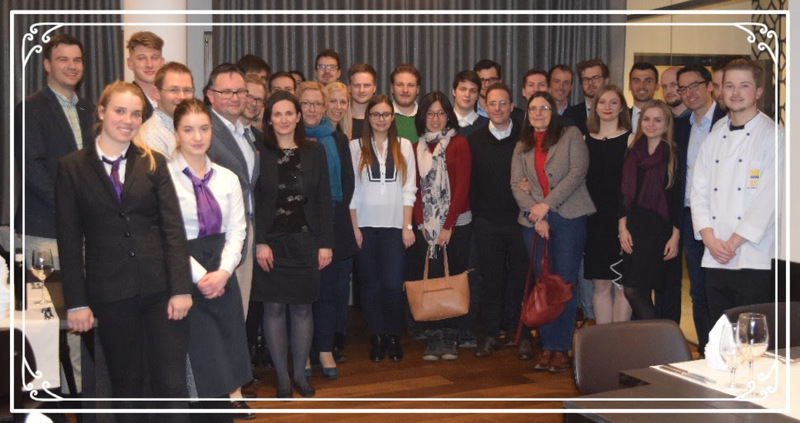 Oxbridge club Slovenia was at the Oxford University alumni weekend in Rome, 6-8th March 2018. It was great to catch up with alumni from Europe, and a privilege to present the society to Lord Patten of Barnes, the Chancellor of Oxford University. You can spot our members on the Oxford Alumni Facebook page. Looking forward to Meeting Minds 2019! The society gathered for the annual Christmas dinner, in proper Oxbridge style. Our partner, Kult316, managed to recreate the feeling of a college hall with a fantastic meal and good atmosphere. We appreciated the address of His Excellency Mr Tadej Rupel, the Ambassador to the Court of St James, in which he stressed the importance of academic collaboration between the UK and Slovenia, the promotion of which is at the core of our society. In particular, we wish to thank our sponsor AciesBio for the sponsorship of the event. The Oxbridge Club Slovenia is the official alumni association for alumni of the universities of Oxford and Cambridge. Oxbridge Club Slovenia Blog at WordPress.com.